There are two recording artist that have earned most of my money – Bob Dylan and Miles Davis. Back in the day I purchased the LPs, and then “upgraded” to CD; I have several shelves of their biographies. I have purchased box sets, CD reissues, expanded editions, SACDs, and vinyl re-issues. Then a couple of years ago there was the Bob Dylan Mono Box. Now Miles Mono Box (and for good measure I picked up the Kind of Blue mono LP too). In the late 50s and early 60s hi-fi was serious business for both the labels and for consumers. Jazz producers took extra care in recording to be as state of the art as they could be. Consumers were buying high quality playback equipment. Stereo was a new innovation and for most recordings an afterthought. The artist and production staff was focused on the mono mix. After the fact someone would take a stab at the stereo version – often without any artist input. Most current day music-heads believe the mono editions (which also happen to be the rarest as subsequent reissues were stereo) as the artist true intent. In many cases (e.g. the Beatles) the mono and stereo mixes were radically different. I like jazz in mono because I feel that is the closest thing to live. Jazz is best experienced in a small club. In that situation you are typically witnessing a small combo projecting out a tight sound stage – although we have two ears – that experience is mono in my mind. In a theater or arena the sound stage is typically wide and a stereo mix is more appropriate (or occurs naturally in a concert hall). In the early days of stereo the mixes cold be very gimmicky and unnatural (e.g. vocals out of one channel and instruments out of another is the worst). It took awhile for the artist and production team to figure out how to use this medium – in general they had not figure that out between 1955 and 1963 when these Miles sides were first issued. So hearing them mono is how they were meant to be heard – ideally via LP. As much as I like the electric Miles and the second quintet, the 1955-1960 era Miles is the best. This collection is the mother lode: amazing bands and the Gil Evans orchestra work. This is a 9 CDs (about half of them have a LP available too) collection and at least three are absolute jazz hall of fame masterpieces (Kind of Blue, Sketches in Spain, and Milestones). When John Coltrane and Cannonball Adderley are playing second fiddle you know you have something special (they are featured on 7 of 9 CDs). I started my listening with the vinyl mono reissue of Kind of Blue. I can’t even begin to tell you how great an album Kind of Blue is – for me it is hands down the greatest jazz album of all time. I have been listening to it for 30 plus years and NEVER tire of it. I sat back and let it blanket me. The mono LP is an absolutely sonically stunning masterpiece, the best version I have in my collection. The CD that came in the mono box just misses enough to make you wish I had deep enough pockets to get the several LP editions that complement the box. But the CDs in mono is plenty rewarding. I have been working my way through the rest of the collection and all the CDs are stunning. 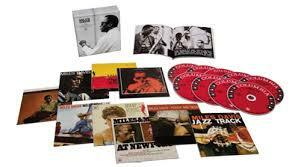 This is a must have set for the Miles Davis fan and excellent introductory lesson for the uninitiated. At $90 it a steep initiation, but the 70 tracks are available on Spotify too. For more information see this post from the official Miles site. 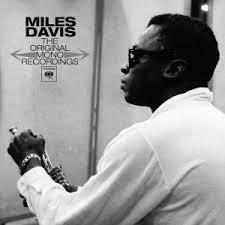 I loves me some Miles, too, and agree about Kind of Blue. Along with Brubeck’s Time Out, they are my two favorite jazz albums (and both are used effectively to personify intellectual cool in the movie Pleasantville). Now I have something else on my wish list, and should probably buy it for my son, too (he plays trumpet and piano).